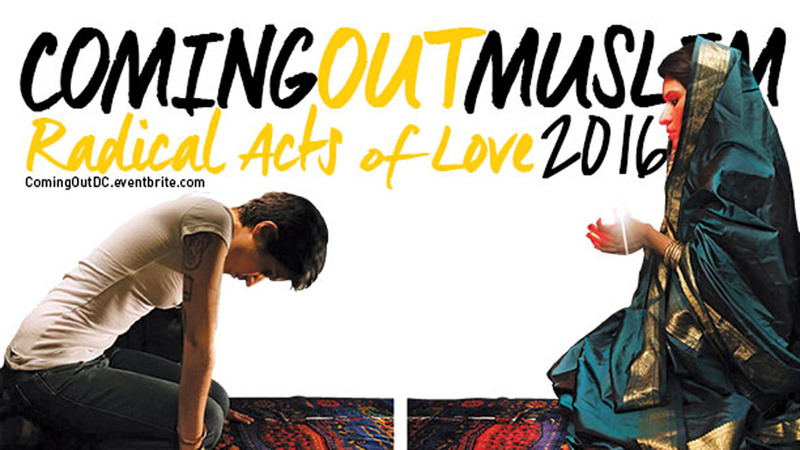 On Saturday, May 21, Tern and Wazina Zondon will perform the play, which captures stories and experiences of being at the intersections of Islam and queerness and its relationship to family, lovers, one’s sense of self and relationship with our faith. The stories “Coming Out Muslim” range from tales about other people’s theories about where queerness comes from, the gifts of being queer and Muslim, the tension between one’s culture and religion, and love—romantic and spiritual. “Coming Out Muslim” is both funny and poignant. The performance will be followed up with a talk-back, panel discussion and open to the audience for Q&A. Although there is a general consensus among Islamic scholars that sexuality outside heteronormativity is prohibited in Islam, a growing number of scholars are revisiting and questioning mainstream Islam’s stance on sexual orientation and gender identity. Like Terna, many LGBTQ Muslims are choosing to come out and reconnect with their faith. In October 2015, HRC Foundation released Coming Out to Islam and to Self, a guide to help LGBTQ Muslims who are seeking to reconnect with their faith and build more inclusive communities. The following day on Sunday, May 22, HRC and Muslims for Progressive Values will host a workshop for LGBTQ Muslims and non-LGBTQ allies to share experiences dealing with oppression and working together towards an anti-oppressive framework. Performance: Saturday, May 21 at 8:00 p.m.
Workshop: Sunday, May 22 at 11 a.m.